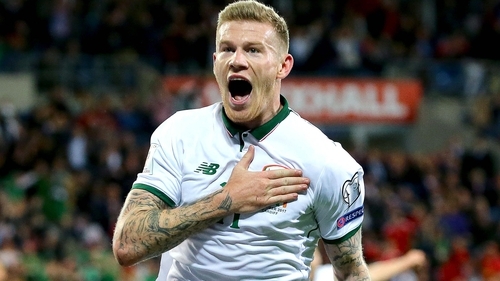 James McClean blasted Ireland into the World Cup play-offs as Ireland performed a defensive masterclass to defeat Wales and silence a passionate home crowd. The Derry native smashed home a 57th-minute winner to push Martin O’Neill's side above their hosts and into second place, finishing behind Serbia, who topped the group. Ireland were roared on by a vocal and passionate travelling support and had to defend with their lives to hang on for 38 minutes of relentless Welsh pressure to progress. The home side showed their attacking intent from the opening exchanges and had Ireland defending deep, just outside the edge of their box as the Welsh midfield zipped the ball around at will. Joe Allen and Aaron Ramsey already looking on the same wavelength, while Hal Robson-Kanu’s pace looked like it could cause concerns in the middle of the defence. And there was an early goalscoring chance for Chris Coleman’s side as a stinging Joe Ledley corner found the head of the arriving Robson-Kanu at the near post but the pace on the contact took the ball just over the crossbar. Ramsey, dropping deep, looking to create, was well marshalled by the Irish midfield and the Arsenal man took the full force of a James McClean barge to let him know that he was in a crucial contest. Ireland were clearing their lines without too much trouble but the ball was just making its way back to the Welsh midfield as Murphy looked isolated running the channels with no support. But the opening ten minutes were all about the Welsh and their fine style of football as Ramsey and Allen created space, while Andy King and Tom Lawrence were also causing problems cutting inside from their respective flanks. Joe Allen was next to be on the receiving end of a McClean lunge but this time it almost worked out perfectly for the hosts as the ball slid through to Ramsey. The Arsenal man took aim and smashed a fine effort towards Darren Randolph’s top left corner, but the Ireland stopper was alert and agile and got a good strong hand on it to send it over for a corner. It took Ireland ten minutes to really get inside the Wales half but it was over as soon as it started, as there was way too much on Murphy’s final ball after some good link up play on the right. Wales maintained their forward momentum but Ireland remained resolute with Duffy in particular staying strong and making some vital interceptions. For all Wales’ possession, they were failing to create attempts on goal, settling instead for a string of corners, which caused little problems for the Irish. The first booking of the night came for a foul on David Meyler by Welsh playmaker Allen, who would not see out the half as things transpired. Ireland’s best chance came in the 17th minute – naturally from a set-piece. Wales were unable to clear and Meyler did well to roll McClean down the left flank. The ball was the right one, as the former Derry City man drilled it across the box, low and hard but Williams was perfectly placed to clear the danger. Wales kept attacking but this time it was Duffy’s partner in crime, Clark, who threw his body on the line to block Allen’s shot. Another half-chance came Ireland’s way as Hendrick’s weak shot was cleared after the ball dropped for him invitingly, as Wales struggled to deal with high ball. And then Duffy almost hit the target in the 31st minute after Wales again struggled to clear a set-piece. Clark fed the ball wide to the Brighton defender and he blasted a decent effort just past the far post. Allen would leave the contest minutes later after suffering a suspected concussion after getting caught in a Meyler and McClean sandwich. Jonathan Williams came on to replace the former Liverpool man. A major turning point, perhaps, as all Wales’ creative play was coming through the Stoke City midfielder. So Wales, out of character, went route one and it almost succeeded as the ball over top was barely cleared. King charged in on goal but Ward just got his body in front. More half-chances followed for Wales, but Ireland were increasingly growing in confidence and suddenly looked a lot calmer on the ball, with Meyler again reading the play perfectly, covering team-mates out of position. As half-time approached, Ireland enjoyed several forays forward and made keeper Wayne Hennessey save at his near post after Brady made a yard of space out on the right and drilled a decent effort on target. The second half appeared to begin with a lot less intensity as perhaps Wales were running out of ideas to get past this solid Irish defensive display. James Chester’s header in the 51st minute had half the stadium celebrating the deadlock being broken, but it flew into the side-netting as Ireland survived. Two minutes later, they came even closer as Robson-Kanu directed an excellent header on target, but another fine save from Randolph kept Ireland in the contest. O’Neill’s side kicked into gear and twice almost got down the right flank as Brady and Christie were causing problems for the retreating reds. But Wales were dogged in defence and while the Irish fans called for a number of fouls, the referee was getting everything right. Then in the 57th minute the home support were both shocked and silenced, and perhaps just a little bit sickened. And it was all of their own making as Williams was caught in possession, allowing Hendrick to deliver a low cross, at pace, across the box. A brilliant dummy by the arriving Arter saw the ball fall straight into the path of campaign talisman James McClean. The Derry man appeared to plant his left foot, watch the ball come onto his right and then drill a magnificent effort low into the net, the Wales keeper unable to get near the ferocious effort. 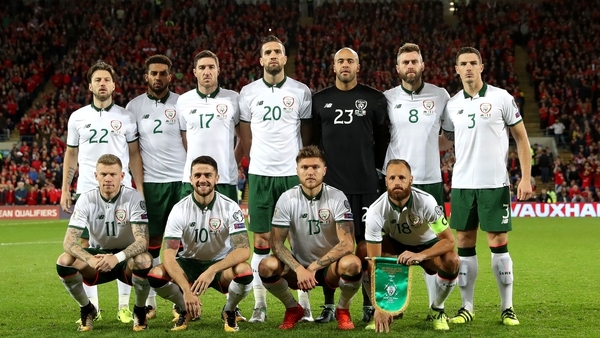 The Ireland players celebrated together in front of the large and vocal travelling support but it was only a moment’s respite, as what followed was a sustained Welsh attack that lasted right until the fourth official indicated that there would be five minutes of injury time to be played. To a man, the Irish team performed heroics to kept the Welsh waves at bay, with Duffy leading by example, mopping up every aerial attack thrown into his area. But Ireland held on. It was tough. It was torrid. But they are through, again on the road to God knows where.